could be considered to be one of the drawbacks of the game. And unless you’re a top professional, the carrying will be all down to you. When it comes to buying a golf bag you’re going to notice there are many choices available. Unless somebody has already explained the differences, right now you might be feeling a little confused. In order to pick the right one there are a few questions you first need to ask yourself. How many clubs do you plan to carry, and are you planning to carry anything else? How would you like to carry them? You might also want to bear in mind whether you’ll be walking the course or using some kind of transport. Let’s look a little closer at the different types of golf bags. Carry bag – This is the kind of bag we recommend you look for if you’re planning to do the carrying yourself. They are designed to reduce the strain on your back, as they are lightweight. Usually they are made of plastic or nylon, but are also available in leather too. Inside this type of bag is a place for your clubs, tees and balls. There will also be room for other things you might want to carry. But be careful not to overload yourself, or walking the course is going to be more of a workout. There are often straps, so they can be picked up quickly and moved on to the next tee. You may find some that have a stand, so you don’t have to worry about laying the bag on the ground to remove your clubs. Cart bag – This is the perfect option if you’re playing on a course where golf carts are a requirement, or you’ve chosen to use one. Heavier than carry bags they aren’t designed for easy lifting. On the whole they are between 5 and 9 inches in diameter, with more storage places than the average carry bag, but designed with organization in mind. This type of bag offers the opportunity to set the bag on the cart and easily sort through it. They are available in a variety of lightweight or heavier materials, but it depends on the manufacturer. Stand bag – This bag has the special feature of a stand, that allows your bag to be off the floor when resting. There will be two stands that flip out of the bag when it’s placed on the ground. No more worries about your bag getting dirty, and this feature also makes it easier to take out your clubs. Pencil or Sunday bag – This type of bag is becoming very popular. They are very lightweight, and much thinner than a carry bag. However, they can still hold 14 clubs easily, because of a 6 inch diameter top. Travel bag – If you’re planning a trip across the country or abroad, a travel bag has been designed to protect your golf bag while you travel. Your usual bag is placed inside and will be protected by this padded cover whilst traveling. There are many different kinds available. For example a soft or hard case. A hard case will offer the most protection, but will be much heavier to carry. You may have problems fitting a hard case bag into the back of your car, but it will be much sturdier if you’re worried about baggage handlers at the airport. Tour bag – This is the largest type of bag, and is the one used by many professionals. They are usually 10 inches in diameter and can weigh as much as 45 lbs. This larger bag can accommodate all the extras a tour player will require such as waterproofs, gloves, balls, tees, refreshments and extra clothing. Shoe bag – There is a wide selection of shoe bags to choose from, and they can make a very handy golfing accessory or gift. As the name implies, they are used to carry golfing shoes to and from the course, and prevent the collection of dirt and grass in your car or locker-room. Golf ball bag – Also called a practice bag, this is used by players to carry and collect balls from the green or practice area. Small and lightweight, they fit easily into the boot of a car or locker, but can hold a surprisingly large amount of balls. If you practice with your own balls, this will be a useful accessory to have. We’ve already introduced you to the various types of golf bag, so let’s take a look at some of the common features. You should then be in a position to decide which particular bag is right for you. Dividers – These divide the top opening of a golf bag. Some have no dividers at all, whereas others have 14-way dividers, with one opening for each club in your set. The dividers don’t usually go all the way down the bag. Putter well – Specially designed to reduce the likelihood of your putter damaging the shafts of the other clubs in the bag. Pockets – Generally there will be one or two pockets, but some bags have more than a dozen. Think about the extra items you’ll be carrying before deciding on the number of pockets. Handles and straps – Make sure you pick a bag with handles or straps that are placed correctly for your needs. For example, if you’re walking the course a single-strap system will be uncomfortable after a while, as it doesn’t distribute the weight of the bag evenly across your body. Umbrella holder – Great to have if you often find yourself playing in the rain. Rain hood – This will keep your clubs dry in the heaviest of showers. Towel loop – Most bags will provide one of these, either in the form of a loop, clip, ring, or otherwise. It means you can keep your towel out and ready to use at all times. 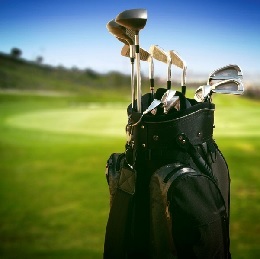 Stay tuned for more in depth details on the various types of golf bag available.